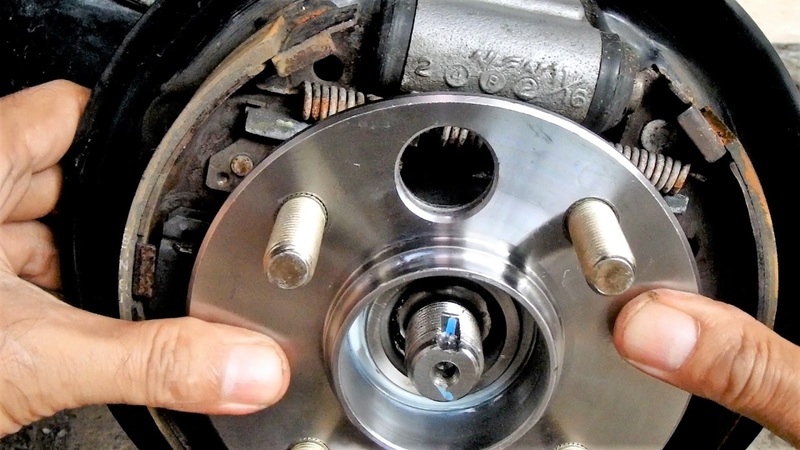 This article is a continuation of the article on how to replace the rear wheel bearings with the type of wheel hub assembly (WHA). 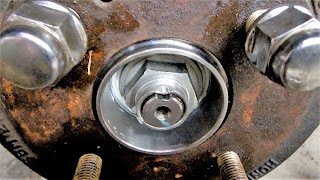 This WHA type bearing is easy to install, no need bearing press tool. 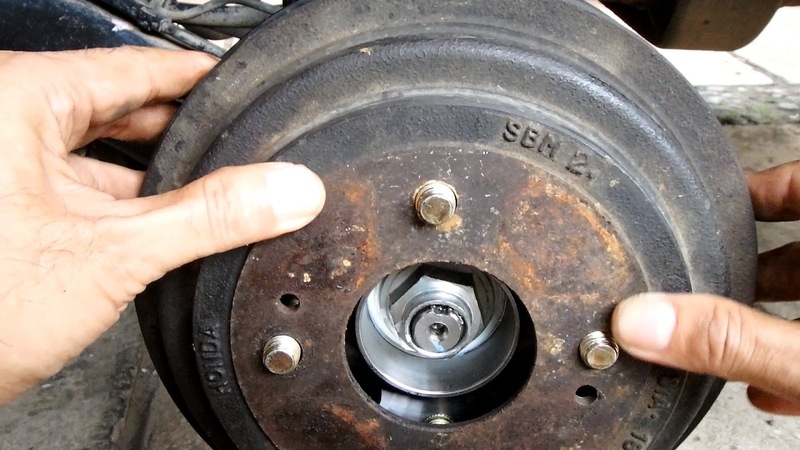 This bearing is often referred to as: hub assembly, wheel hub unit, wheel hub bearing. 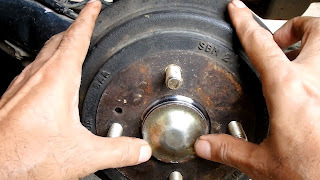 Read also about how to check the sound of a wheel bearing by turning the wheel by hand. 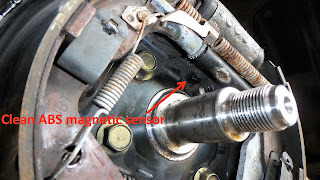 Clean spindle (axle), Anti-lock Braking System (ABS) magnetic sensor as indicated by the arrow in the above photo, and surrounding area. Soapy water can be used, then rinse with clean water. 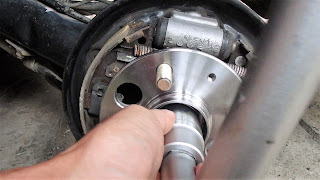 The installation procedure for wheel hub assembly can also be seen on YouTube video. As the above photo, install the new wheel hub assembly (WHA) bearing by inserting the axle into the bearing hole, then push the bearing by hand until stopped. No need to be pressed by special tool. Attach the axle nut, usually can be easily rotated by hand until the bearing is steady. Tighten the axle nut by socket wrench with 3/4 inch handle. Tighten to torque specification that is suggested by bearing manufacturer. For Honda City, Fit, Jazz torque for rear wheel spindle nut is 134 ft-lbs ft = 181 Nm = 18.5 kgf.m . More details about axle nut torque specification for various brands and models of cars can be read in SKF bearing catalog brochure. If a torque wrench is not available, the following torque principles can be applied. See the picture above, torque or moment or force moment is the force multiplied by the length of the arm. If the arm is shortened by half (L), to ensure the torque is constant, the force must be increased 2 times (2F). If the arm is extended 2 times (L + L = 2L), then for constant torque, the force is reduced to half (F). 18.5 / 70 meters = 0.264 meters or equal to 26.4 centimeters. So with a weight of 70 kg, if you step on the handle of the socket with a distance of about 26.4 centimeters from the center point of the nut or axle, with both feet raised from the ground, it will provide torque of 18.5 kgf.m. To ensure accurate torque, the socket handle must be in a position close to level to horizontal line or ground. If the handle position is not close level, the torque will be reduced. In the position of the handle perpendicular to the ground, the torque will be zero. Do not jerk your feet when stepping on the socket handle. If the socket is easily detached from the nut, it is necessary to ask for help from another person (helper) to hold and ensure that the socket is still holding the nut, when the socket handle is stepped on. More details about the principle of torque or moment of force can be read on the wikipedia page. 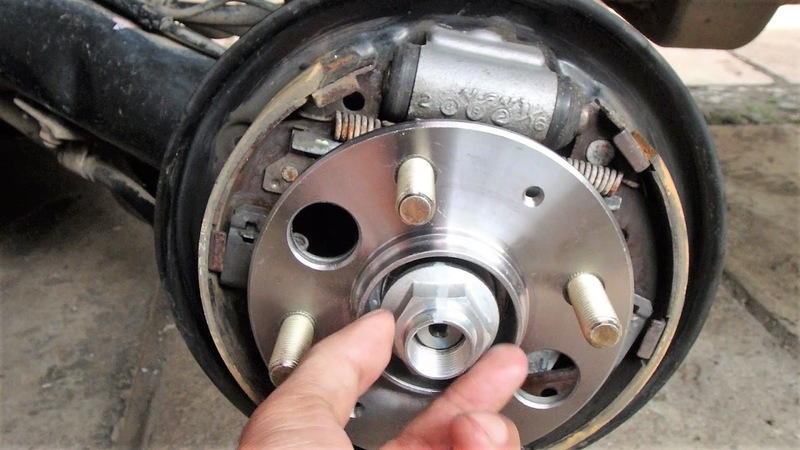 Install the brake drum by pushing it by hands, after wheel stud bolts are aligned into holes on the brake drum, like mounting the wheel. As you can see in the photo above, 2 wheel nuts are installed to protect the wheel stud bolts if the hammer is missed. 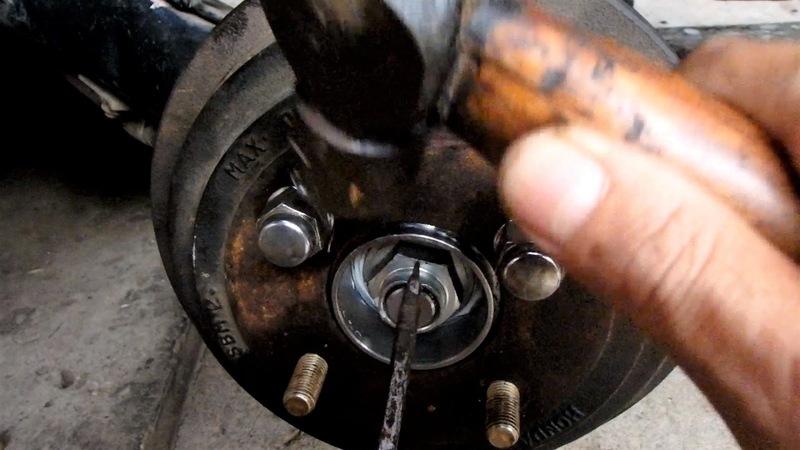 Using a screwdriver or a center punch with a hammer to make a notch on the spindle nut to lock the nut. In the photo above, a notch has been made on the nut. Make sure the notch is deep enough to avoid the nut to rotate or loosen. Attach the nut cap by pressing it by hand. Then install the wheel, jack stand and jack can be removed. Work has been completed.